Take your first step towards yoga! 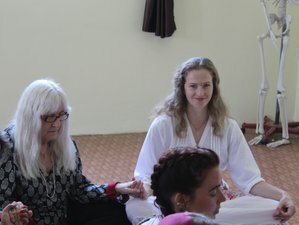 With the registered Yoga Alliance school in Rishikesh; Rishikesh Yog Sansthan, delve into the practice of mantra chanting, yoga Nidra, kirtan, yoga philosophy with a powerful meditation course in India. During this retreat, enjoy 15 days in and around Rishikesh, India, as you explore the local temples and surrounding areas. In addition to your yoga classes, you will enjoy nine different outings within and outside of Rishikesh. You will be accommodated for 13 nights in a private single room at Rishikesh Yog Sansthan in Rishikesh, India and one night in a shared room in Agra. This retreat gives you the opportunity to learn a different style of yoga asana, meditation, and pranayama, and get to know more about yoga with yoga philosophy classes. This 15-day yoga tour is based on traditional Hatha and Ashtanga yoga and is ideal for beginner yoga practitioners with a basic knowledge of yoga. It is also suitable for intermediate and advanced practitioners. Students will be having asana classes twice a day, pranayama, meditation, and yoga philosophy classes. Students will get the opportunity to do their yoga practice in different places in and out of Rishikesh. There will be two sessions of Ayurveda massage with a consultant. You will go to Agra and stay there for a night in a hotel and visit Taj Mahal and India Gate. On day 15, you will be dropped at the Indira Gandhi International Airport (DEL). You will be provided with three delicious meals each day, with herbal tea. If you wish, the coffee machine is available. There are also fruit juices (carrot, pineapple, mango, banana). You will receive two Ayurveda massages and a free Ayurveda consultation.